Diversity Richmond is a catalyst, a voice, a place and a resource for Richmond’s LGBTQ+ community. In April 2015, The Richmond Gay Community Foundation and the Gay Richmond Community Center announced a structural change to our organization, combining both entities into Diversity Richmond. The new name was chosen to better reflect the diversity and inclusion that was already evident in our mission. Diversity Richmond is a leader in the effort to create a permanent and sustainable non-profit structure in Richmond dedicated to serving the LGBTQ+ community, their families and allies. We advocate for fairness, working closely with others who share our vision. In the last 15 years, much has changed in the fight for LGBTQ+ rights. Diversity Richmond has evolved into a multi-faceted organization, while remaining a respected a voice for the acceptance of sexual and gender minorities. We envision a community where LGBTQ+ citizens are treated with respect and dignity, and their unique gifts are championed and celebrated, enriching the colorful fabric of our community. 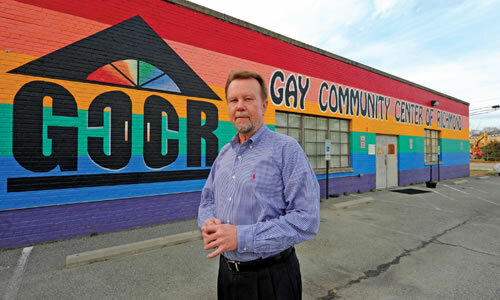 The Gay Community Center of Richmond was founded in 1999 to provide support for the agencies and groups that serve Central Virginia’s sexual and gender minority people, and to educate the public about the many issues facing our community. In 2004, GCCR purchased our current facility, which has undergone extensive renovations through the years, with much yet to accomplish. In 2000, Jon Klein opened a Main St. thrift store called Out of the Closet Thrift. The name was later changed to Diversity Thrift, and is now one of Richmond’s best known and most popular thrift stores. Diversity Richmond raises money through community donations to and sales from Diversity Thrift, our retail store, and Diversity Bingo!, a popular community activity, in addition to our member program, space rentals and special event fundraising. Proceeds are used to support local non-profit, LGBTQ+ and LGBTQ+-friendly community-based organizations. In addition to our Board of Directors and staff, Diversity Richmond depends on the amazing assistance of community volunteers, in addition to partnerships with so many other non-profit organizations. Since its inception, Diversity Richmond has distributed more than $850,000 to area non-profits organizations, such as Richmond Triangle Players, Fan Free Clinic, ROSMY, Equality Virginia and many others. Grant recipients use these funds to support programs that strengthen the LGBTQ+ community and, by extension, our entire community. In addition to supporting our community financially, Diversity Richmond is a collaborator, convening groups with similar aspirations to effect social change and encourage acceptance. Some of our programs have served as catalysts for the creation of other organizations, such as the Richmond Business Alliance and we partner with national entities to create locally-focused resources. We are proud of our associations with diverse groups, including Jewish Family Services, LBGT Cancer Resources, and the Black History Museum. Additionally, local artists display their work in our Iridian Gallery, providing artistic commentary on modern-day societal issues. Diversity Richmond is generous with its physical resources, providing free meeting and storage space and lending equipment, props and other items to groups, clubs and communities of faith, to support community outreach. Our facility includes classrooms, an event hall, a gallery, storage rooms and more. A good portion of the building is utilized by Diversity Thrift.